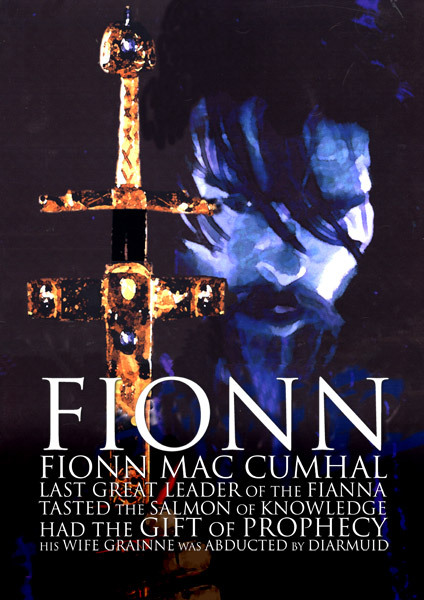 Finn (Fionn) was the hero of the Fenian cycle and was the greatest leader of the Fianna. He was born after the death of his father, and so reared by a wise woman who taught him well, and encouraged a strong affinity to nature. His first major act was to kill his father’s murderer, Goll. Having completed this revenge he ventured to Finnegas. Finnegas was a bard who taught Finn the art of poetry and also the gift of prophecy along with general wisdom. Finnegas caught the salmon of knowledge and gave it to his young pupil to cook. As he did this Finn burnt his finger and so placed his thumb his mouth. From this he gained supernatural knowledge. Finn was made the leader of the Fianna by saving Tara. Each year Tara was burnt to the ground at the feast of Samhain by a goblin called Aillen. Aillen would enchant the palace and send everyone to sleep, then burn down the palace. Finn kept himself awake during Aillen’s visit by resting his cheek against a spear made by Len, sword maker of the Gods, and so was able to kill the goblin. Finn was a strong leader of the Fianna. He hunted a boar who tried to lead him and his men to the Otherworld. Finn’s death was foretold as occurring when he drank from a horn. In his later years he attempted to jump across the River Boyne, but as he had by now drunk from a horn, he fell into the river and was drowned. Finn was a clever hero who led his band of men through many adventures and challenges, and armed with his strength and knowledge became the greatest leader of the Fianna.